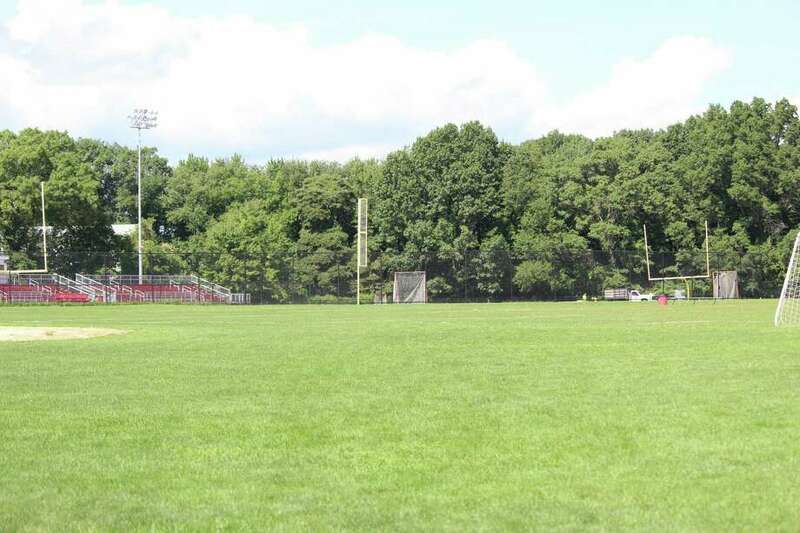 The turf field at Fairfield Warde High School will not be finished until the end of September, prompting school teams to use the grass fields and move games and practices to other schools. FAIRFIELD — The turf replacement at Fairfield Warde High School was supposed to be done by August, but now the district is saying it’ll take longer than planned. The announcement caused confusion during the Board of Education’s Tuesday meeting. Parents and board officials had expected work replacing the field would be done in time for the start of school. But the completion deadline for the $750,000 project changed over the summer due to problems with subcontractors and the scoreboards that had been ordered. “We didn’t know all along,” Thomas Cullen, operations director, assured the board. He said they learned in mid-July after a meeting with Sprinturf that instead of being ready by the end of August, the field would be done by the end of September. Even if the field installation had been completed by the end of August, Superintendent of Schools Toni Jones said they still wouldn’t have access until the end of September because of the track installation. The track will not be repaired and refinished at this time. “It’s the expected timeline, but it’s not,” board member Jennifer Maxon Kennelly said. Originally, the district planned on replacing the field last summer, but the project was bumped to this year and parents were told it would be a 90-day project. An August update to parents detailed where various athletic games and practices would be held until the turf field becomes available for use. The first home football game on Sept. 14 will be played at Fairfield Ludlowe High School, while field hockey will be played at Tomlinson Middle School’s turf field. Varsity soccer will stay at the high school on the grass field, while junior varsity will move to Tunxis Hill Park and freshman soccer to Fairfield Woods Middle School. The most recent communication from Sprinturf, dated Aug. 29, said it expected concrete work needed to relocate and complete runways and high jump pads would start that day, and turf installation would begin the week of Sept. 3, barring any weather delays. “The turf field can be utilized before the new scoreboards are installed in order to give you quick access to the field,” the letter from Sprinturf’s Webb Cook said. Cullen said the scoreboards initially ordered by Sprinturf, which has been acting as the general contractor, were generic, and did not have the school name on them. The scoreboards simply said “home” and “away,” Cullen said. Sprinturf’s concrete subcontractor quit during the project, school officials said, and there were also issues with the electrical contractor, adding to the delays.